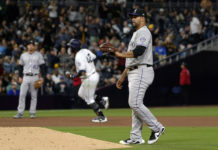 The Colorado Rockies faced off against the San Diego Padres Monday night at Coors Field in the first of a three-game series. 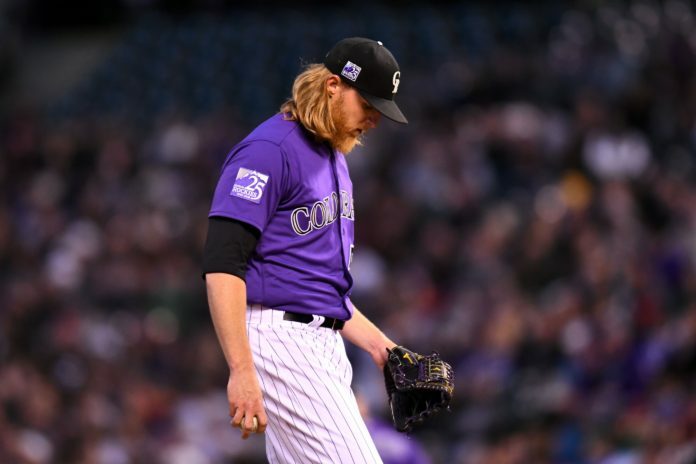 A trio of home runs kept Colorado in the game, but the Rockies were unable to overcome a shaky outing by starting pitcher Jon Gray and lost 7-6. 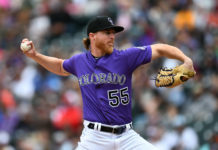 Gray (1-2, 5.63 ERA) showed flashes of the dominance he exerted over the Padres last week when he pitched seven innings of shutout ball in a 5-2 Rockies victory, but a few bad pitches were his ultimate undoing Monday. Gray started the game off strong by striking out the side in the first inning but struggled to find consistency on the mound moving forward. The Padres plated a run in the second inning as Jose Pirela leadoff with a single to right field and scored via an RBI single from Manuel Margot. The Rockies scored a run of their own in the following half-inning when Ian Desmond blasted an opposite-field home run to right field. The Padres pulled ahead big in the fourth inning, scoring five runs on four hits. After retiring the first two hitters in the inning, Gray surrendered a triple to Freddy Galvis to give the Padres a runner in scoring position. Catcher Austin Hedged then ripped a double to left, scoring Galvis. The Rockies then intentionally walked Margot to face pitcher Clayton Richard, who slammed a three-run home run to right field. Still rattled by the home run allowed to the opposing pitcher, Gray slipped in the following at-bat against Carlos Asuaje, who follow up Richard’s home run with solo shot of his own to give the Padres a 6-1 lead. Colorado would claw back within one in the bottom half of the fourth. Trevor Story ripped a one-out double to left, which was followed by an Ian Desmond walk. With two runners on, catcher Chris Iannetta blasted a three-run home run to center field and put the Rockies back in the game. Bud Black stuck with Gray in the fifth inning, but it would be Gray’s last. Eric Hosmer hit a single to start off the inning and was then driven home by a Priela double to deep right field. Gray’s night ended with a disappointing line of five innings pitched, surrendering 10 hits and seven runs. He struck out six batters and walked one (intentional). Gray has 13 strikeouts to just the one walk over his last two outings. Richard (1-1, 5.29) matched Gray’s five innings, allowing four runs on five hits, striking out three and walking three. Antonio Senzatlea worked a clean sixth inning and the Rockies pulled within one run after a Carlos Gonzalez two-run, opposite-field home run off former Rockies pitcher Jordan Lyles to make the score 7-6 after six. Lyles put runners on first and second with no outs in the seventh, but Craig Stammen worked out of the jam to earn his third hold. Stammen struck out Nolan Arenado before forcing Story and Desmond to ground out. Adam Ottavino continued his strong start to the 2018 season, striking out the side in the top of the ninth. Brad Hand, who allowed three unearned runs and took a loss on April 5 against Colorado, struck out the side in the bottom of the ninth to end to earn his third save on the season. NEXT UP: The Rockies and Padres continue their series Tuesday night at Coors Field. Tyler Anderson (0-0, 7.56) will square off against Joey Lucchesi (0-0, 2.79). First pitch is scheduled for 6:40 p.m. MDT.